Make your next Pharmaprix trip more rewarding. 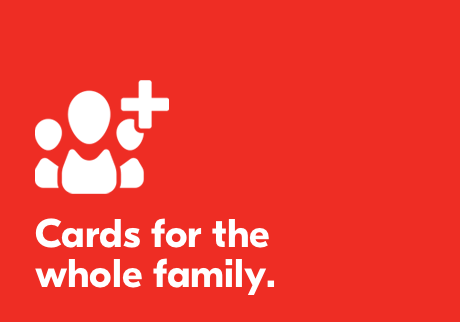 Add up to four cards to your account for your family members. 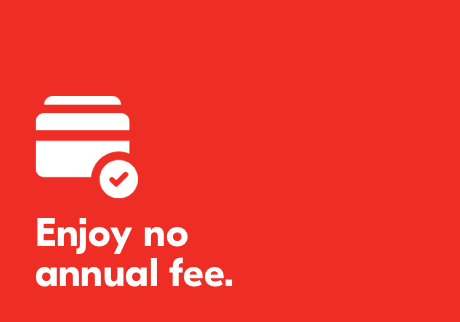 Enjoy our no annual fee PC Financial Mastercard® credit cards, no matter which card you hold. To view this chart as text, click here. For the most current information, visit pcfinancial.ca or phone 1 866 246 7262. Subject to credit approval and eligibility criteria. 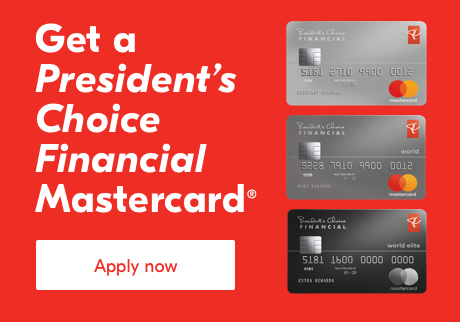 President’s Choice Financial Mastercard® has no annual, membership or renewal fee. Each account statement normally covers between 28 and 33 days. There is an interest-free grace period of a minimum of 21 days for new Purchases (meaning purchases which have not appeared on any previous statement) if you pay your entire current statement balance in full by the applicable due date, otherwise interest is charged from the transaction date. The interest-free grace period does not apply to Cash Advances (which include balance transfers and convenience cheques), and interest is charged from the transaction date. The minimum payment per account statement is any past due amounts, plus: your statement balance if $10 or less, or the greater of (a) $10, (b) 2.2% of your total statement balance, or (c) the interest charges and fees billed on the current statement plus˛$1. Annual Purchase Interest Rate of 19.97% applies to all purchases and to any fee, charge or markup treated as a purchase according to your Cardholder Agreement. Annual Cash Advance Interest Rate of 22.97% applies to all cash advances, non-promotional balance transfers, and any other transaction, fee or charge treated as a cash advance according to your Cardholder Agreement. Based on your account use (including whether you exceeded your credit limit or had any dishonoured payment transactions), credit history (including your credit bureau reports) or both, we may, upon providing the required notice, increase the above rates of interest to the Annual Performance Interest Rate of 25.95% for Purchases and 27.95% for Cash Advances. The Annual Default Interest Rate of 25.97% for Purchases and 27.97% for Cash Advances will apply to your entire unpaid balance if you fail to make your minimum monthly payment by the due date for two consecutive billing periods or if you are not in full compliance with the terms of your Cardholder Agreement. For foreign currency transactions, the foreign currency conversion markup percentage charged for purchases and cash advances and deducted from refunds and credits is 2.5% of the amount of the charge or credit transaction. Other fees are: cash advance at a bank machine or teller in Canada: $3.50; cash advance outside Canada: $5; overlimit charge if over the credit limit on statement date: $29; cash equivalent transaction (such as for a wire transfer or money order): 1% (minimum $5, maximum $10); dishonoured payment or convenience cheque: $42; copy of a sales draft or previous account statement: $10; credit balance refund made by cheque: $20; balance transfer fee of 1% of the transferred amount for balance transfers requested six months or more after account approval; Inactive account: if on your statement date there is a credit balance on your account and there has been no activity on your account (meaning no debits, credits, interest or fees) for the preceding 12 consecutive months, your account is subject to a fee equal to the lesser of $10 or the credit balance amount. 1 All PC Optimum members earn 15 points per dollar on eligible purchases at Pharmaprix and Shoppers Drug Mart. When you use your President’s Choice Financial Mastercard® you will earn additional points per dollar: 10 points per dollar for President’s Choice Financial Mastercard® cardholders; 20 points per dollar for President’s Choice Financial World Mastercard® cardholders; and 30 points per dollar for President’s Choice Financial World Elite Mastercard® cardholders. 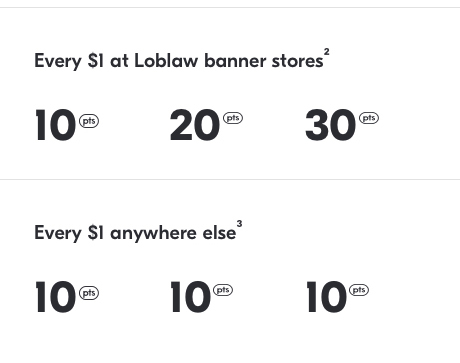 2 Affiliated Loblaw banner grocery stores and Shoppers Drug Mart / Pharmaprix. 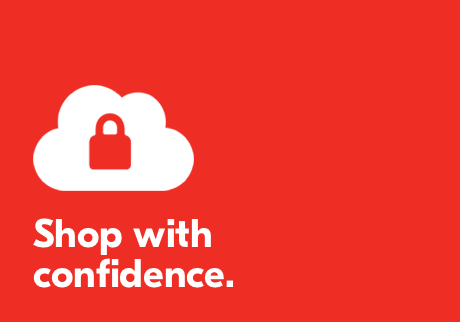 Visit pcoptimum.ca for details on participating stores where the PC Optimum program is offered. 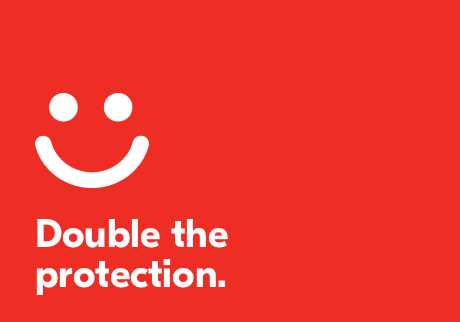 3 Earn a minimum of 10 PC Optimum points per dollar on all of your purchases charged to the credit card. 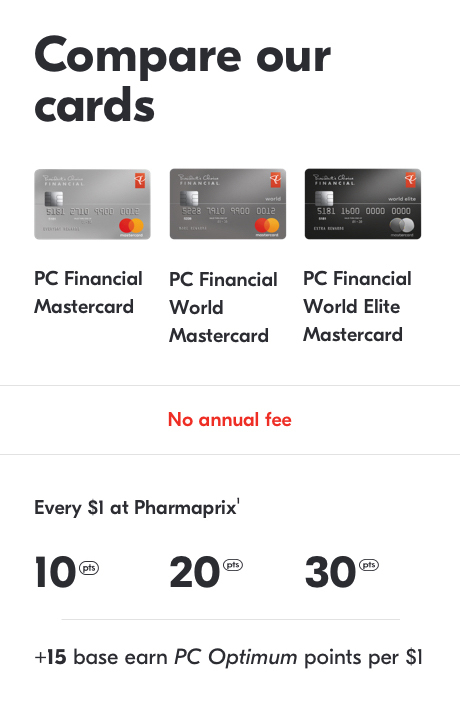 Any bonus PC Optimum points offers available to all PC Financial Mastercard® customers are calculated based on the regular earnings rate of 10 PC Optimum points per dollar spent. This offer may be terminated or changed at any time. 4 Your Certificate of Insurance for Purchase Assurance and Extended Warranty is included in the envelope with your card. Purchase Assurance and Extended Warranty are provided by American Bankers Insurance Company of Florida. Some conditions apply. 5 You must apply by December 31, 2019 in order to be eligible for the promotional balance transfer offer of a 0.97% interest rate for six months. For current promotional rate and term, if any, after this date go to pcfinancial.ca or call 1 866 246 7262. The current promotional balance transfer offer is available to eligible new customers only, within 90 days of account approval. This offer may be changed, extended or cancelled without notice. 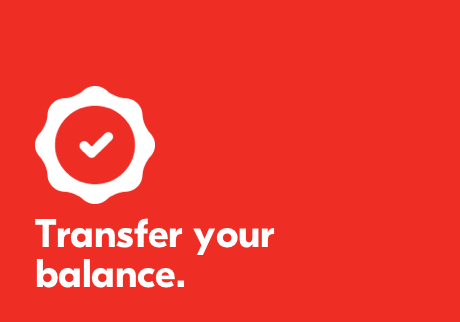 Each balance transfer is posted to your account as a cash advance and interest will be charged from the day the balance transfer occurs. Promotional rate is annual, and unless your account is in default, the promotional rate applies from the transaction date for six months after which the cash advance interest rate (currently 22.97%, subject to change) applicable to your account at that time applies to any remaining balance until the balance is paid in full. If your account is in default, the default rate of interest applies to your entire outstanding account balance from the date of default. 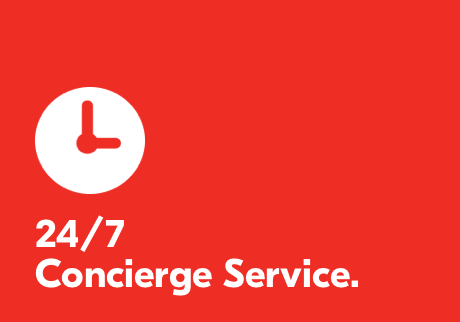 6 Concierge Services are provided by Assurant Services Canada Inc. (ASCI). Details of your service are outlined in the Terms and Conditions sent with your card. ®/™ Trademarks used under licence. ®/™ Mastercard is a registered trademark, and the circles design is a trademark of Mastercard International Incorporated. President's Choice Bank is a licensee of the marks. ®/MD Pharmaprix and Shoppers Drug Mart are registered trademarks of 911979 Alberta Ltd., used under license. 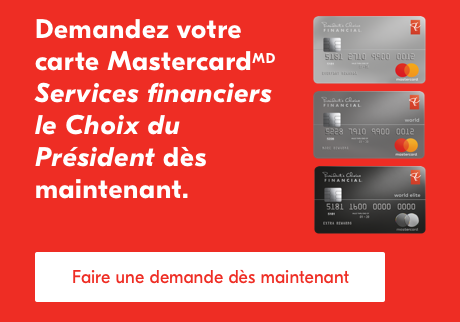 President’s Choice Financial Mastercard® is provided by President’s Choice Bank. The PC Optimum program is provided by President's Choice Services Inc.